Actor Al Pacino attends the curtain call for the 2010 Public Theater Gala at the Delacorte Theater on June 21, 2010 in New York City. 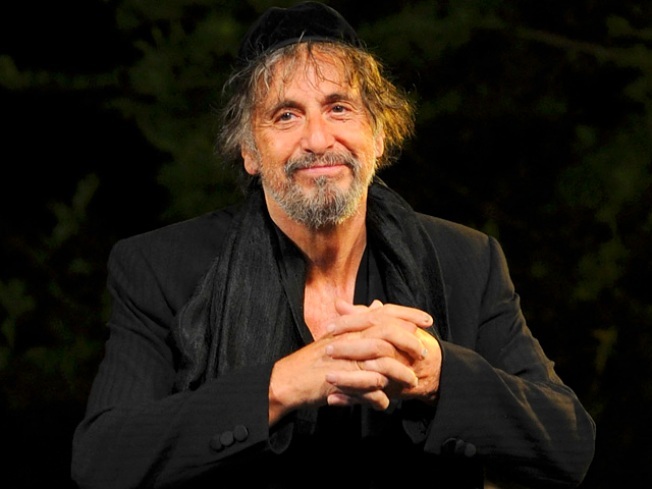 Al Pacino's Shylock going from green pastures to the Great White Way. The critically acclaimed, sold-out performance of “The Merchant of Venice” for Shakespeare in the Park is ending its run in Central Park’s Delacorte Theater next week but the show will go on this fall on Broadway. Staged by The Public Theater, The Merchant of Venice will move to the Broadhurst Theatre on West 44th Street from Oct. 19 until Jan. 9 2011. A critic with the Wall Street Journal called it “one of the best Shakespeare performances” ever, largely due to movie Pacino’s portrayal of Shylock. Pacino will take the stage for 78 of the Broadway shows. “The stunning success of our Shakespeare repertory in Central Park this summer will be celebrated by the move of The Merchant of Venice to Broadway,” said Public Theater Artistic Director Oskar Eustis in a statement.